Diane von Furstenberg is an amazing designer who has become an international icon. She has received the Lifetime Achievement award from the Council of Fashion Designers of America (CFDA) and her famous wrap dress is in the collection of the Costume Institute at the of the Metropolitan Museum of Art. She is currently the president of the CFDA and the DVF Spring 2015 collection falls nothing short of expectation. Diane von Furstenberg's Spring 2015 line is a beautiful mix of colours, florals, and 50s inspired looks with a modern twist. The shorter hemlines and crop tops modernized the 50s style keeping the line fresh and current. The collection was full of fun with light fabrics perfect for walking around in a nice summer breeze. I loved that the prints were bold and feminine, while remaining easily wearable for anyone. The hot pink colours, floral prints, and flowing fabric created a flirty vibe. Up and coming model Kendall Jenner (left) wore a black and white lace dress, while supermodel Naomi Campbell (right) strutted down the catwalk in a light and breezy spaghetti strap dress rounding out the line. At the end of the show, Dianne von Furstenberg walked the runway adorned with a smile, greeting friends and laughing, celebrating another successful show! 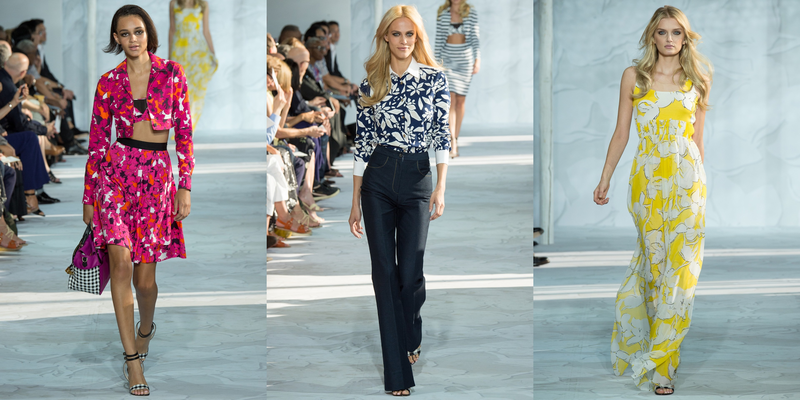 What do you think about the DVF Spring 2015 collection?